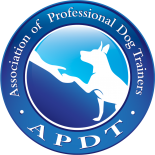 Well the dogs love treats, and associate the treats with the training and in turn love training. Complicated yet simple. Nowadays, we use marker or clicker training primarily when we start training, I could write a whole other blog on it but I’ll save that for later. This type of dog training is considered classical conditioning, or associated learning. If you feed a dog every time you say the word “Yes” or every time he hears your clicker, the clicker or word becomes a stimulus for food. Along with classical conditioning we also use operant conditioning. Which at it’s core is cause and effect training. There are 4 types of operant conditioning we use as trainers. For the purpose of the following explanation positive refers to adding, while negative refers to removing. Positive Reinforcement – The dog does a behavior we like or want and he gets rewarded, He is now more likely to do that behavior again. It’s a totally positive experience for the dog. Negative Reinforcement – An example is that the dog isn’t doing something we want so we correct him with a pinch collar, when he stops doing the behavior, we release the correction. He now knows that if, I don’t do that behavior, I won’t be corrected. Making the behavior less likely to happen in the future. Positive Punishment – A negative consequence for a behavior. The dog is does a behavior we don’t want so we correct it right away. Adding the correction as soon as the behavior happens, he then associates the correction with the behavior and stops doing it. Negative Punishment – This is withholding a reward for a behavior. We tell the dog to sit, he doesn’t sit, so he doesn’t get the treat or toy. Once he sits, he gets the reward. He starts learning that doing what is asked right away gets him a reward faster, if he doesn’t he gets nothing. Leerburg.com has a lot of great information about training dogs and dog behaviors, which is where I learned a lot of this information some time ago. I encourage you to do a little digging on their site to learn more about training so we can work together training your dog with as few hiccups as possible, making our training time that much more effective!